Are you always terribly busy in the Spring? I know we are! There is Spring break, teacher conferences, Easter, Spring gatherings and more! That is why I am here to share a super easy and tasty snack that you can whip up with Nestlé products in no time flat. It is hard to be a balanced mom sometimes... I know I struggle with this a lot. It seems I have so much on my plate at times and every evening I am driving the kids from one activity to the next. I've learned to not over-do my to-do list and on the really busy weeks to focus on one day at a time to stay afloat. That is why I am glad I have Nestlé productsto rely on for Spring gatherings and when I need to prepare a special treat quickly. I know that Walmart has a great variety of Nestlé productsat my fingertips, which helps me to balance my time better! Hi everyone! Welcome back to our third month of 12 Months of Wreaths! I have been seeing a lot of tulip wreaths lately and I wanted to try my hand at making one myself. Wow, this wreath looks complicated, but it has been one of my quicker wreaths that I have made. I kept it simple, with a burlap bow on one side with tulip buds cascading out on both sides. I also added a script monogram 'A' to the other side. The tulip buds are already starting to pop up in my yard, so this wreath couldn't have been made at a more perfect time! Welcome to 12 Months of Wreaths - March! Hey everyone! Today I wanted to share my new (to me) subscription box to Fab Fit Fun. I recently canceled my Ipsy and Peaches & Petals subscription boxes for various reasons and decided to try something new. I've been wanting to try the Fab Fit Fun box for awhile now, but the price was holding me back. I received a really awesome coupon deal in the mail and received my first box for only $34.99. Fab Fit Fun is $49.99 every 4 months and comes out each season. I can't wait to see what is in the winter box! I received this tan, white and black Modcloth scarf in my box. They had several different colors of scarves, so I had no idea which one I'd receive in my box. I also received this adorable mug, I love anything in gold/black or white/gold! I can't wait to sip some tea in it this fall! It's no secret, I love vintage furniture. I have several Ikea pieces purchased long ago and I've been changing up the look of those pieces with trim and paint. 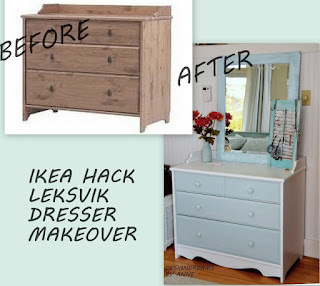 During my bedroom redecorating project, I began a makeover of my Ikea Leksvik dresser. I like the look of the dresser but I was ready for a change. And I changed it 7 times! Take a look at all the different looks this dresser went through before I decided what to keep.